Great Reviews, Amazing 50 mile views! High above sleepy Coral Bay on Bordeaux Mountain sits Skyflower, named after the beautiful blue Plumbago which grows in profusion on the property. This newly built 2 BR/3 BA home is in the West Indian style with Great House and bedrooms in separate buildings. 2 people have access to only upper unit and lower unit will be unoccupied and locked. Property managed locally by James M. Miller Property Management. The panoramic views from all rooms are spectacular, overlooking the British Virgins, St Johns East End, and Coral Bay. Skyflower provides an enchanting Caribbean experience and the ultimate in privacy for honeymooners, two couples, or a small family. The Great House provides dining and entertainment space and a separate, two story building houses two equal size bedrooms and baths. 1500 square feet of deck unites the buildings into one indoor/outdoor living space. The kitchen is a fully equipped 'cooks' kitchen with stainless appliances, marble countertops, quality utensils, and good lighting. Dining is inside on an antique family dining table or 'al fresco' under the covered deck. Separation of the bedrooms from the Great House and from one another assures privacy for all guests. On the same level as the Great House the upper bedroom has a king sized, hand carved mahogany four poster bed with comfortable bath with a door to the private outdoor shower. The downstairs bedroom with adjoining living area is accessed by an outside staircase. This bedroom has 2 twin beds which can be joined to make up as a king. A lovely bath opens unto a tiled garden shower. The house was perfect! They had everything you could need. It was up a VERY steep road to get there. I am normally pretty comfortable with St. John roads but this was extremely steep, especially in the rain. Lovely home and, of course, religious views. 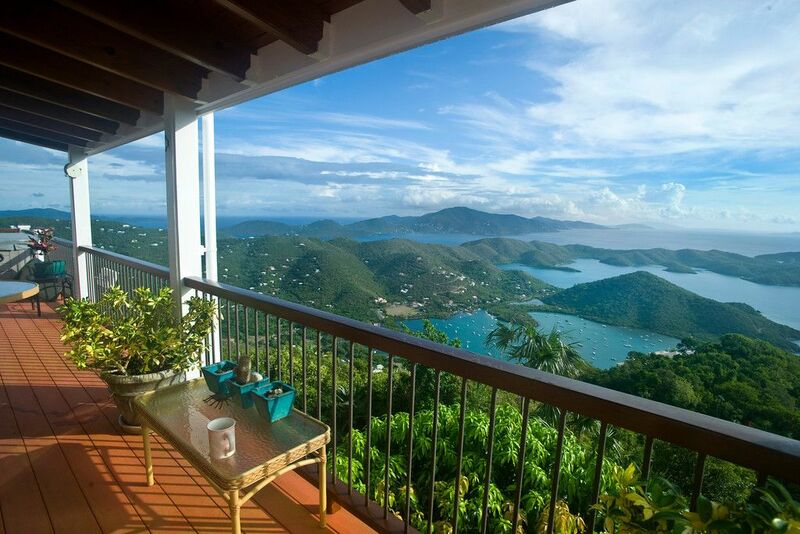 We’ve stayed in 8 properties on St. John, and this is is most beautiful, inside and out. The pictures show part of the front deck view; you see more like 220 degrees of beauty when you’re there. I’m recovering from a medical procedure, and we knew we would be spending more time at the house: what a house! The owners have decorated with love and attention to every detail. From the garden outside to the elegant kitchen with more appliances, cutlery and dishes than a party of 8 might use, to the three bathrooms with doors to outside views (both outdoor showers are terrific), to the plants in the house and on the deck, Skyflower became our more-than-we-expected retreat for a week. We had two minor problems while we were there, and Jim (James Miller, management) was on the spot immediately. That means a great deal on this beautiful island where getting from one side to the other sometimes takes time. We very much hope to return to Skyflower in the future. Fantastic views and an amazing house! Gorgeous patio with amazing views of the entiremail bay all the way past Tortola! Very private and amazing star gazing from the hot tub, the amenities were perfect and it's close to a small grocery store for food. Our only problem was the refrigerator went out but the manager and owner supplied us with a temporary fridge until the part came in. Highly recommend staying here we will definitely be back! We just came back from 7 wonderful days at Skyflower. Wow, this is such an amazing place. The views are breath-taking from the top of Bordeaux mountain. The pictures do not do it justice. We spent our mornings drinking coffee and taking in the warm summer sun and the cool ocean breeze. The location is perfect for taking in the sights and sounds in the middle and eastern end of St. John. The accommodations are excellent and the size of the apartment was more than enough for my wife and I. Everything in the suite is in excellent condition, and there's a full kitchen and modern grill if you're inclined to cook. Having spent the previous week at a villa just outside of St. Cruz I can assure you that Skyflower provides the best bang for the buck available on the Island. Bill and Jan are wonderful, and invited us up for drinks and appetizers one evening and we now consider them friends. Can't recommend this place strongly enough! Just a note to future guests. The owners occupy the upper portion of the house from Jan.1 till May 5 and rent the bottom apartment. We had the absolute pleasure of staying at this magnificent villa for 9 days and it was not nearly long enough...we could have moved right in ;) I would never get sick of the most amazing view right from the porch and from every window in the house. We had another couple join us for part of the time and this villa offered outstanding privacy and space. Everything was clean and we had all we needed. They had wonderful chairs, towels and coolers to use for our days at the beach. We are now spoiled and do not want to stay anywhere else on St. John. Do not hesitate to book this place if you can find available dates. Thank you for opening your magical home to us! We will never forget our time at SkyFlower and the best island out there-St. John!!!! My wife and I stayed at Skyflower for our Honeymoon and had an amazing time. The view looks the same as in the pictures but the real experience is breathtaking. Getting used to no air conditioning on the island was an adventure but the villa is at the top of the mountain where the wind cools.